Savannah Dentist is Giving Away Tickets! 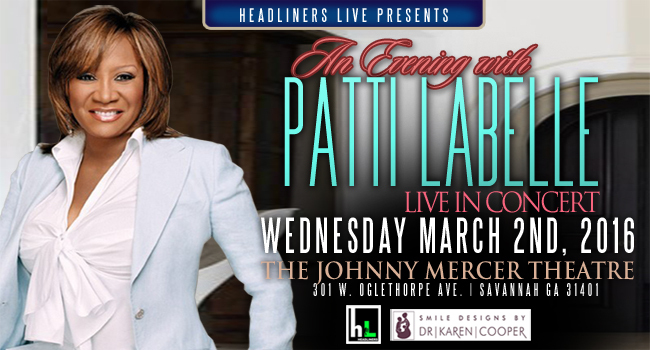 Our Savannah Dentist is giving away 10 pairs of concert tickets to see the fabulous Miss Patti Labelle in concert. A not-to-be-missed evening of soulful and sultry songs by one of the great artists of our generation awaits our lucky winners. We are sure that you will enjoy her talents and have a great time. One pair of tickets will be drawn each week up until the concert, with the last weeks winner (week of Feb 22nd) receiving 2 pairs of VIP Front Row tickets! Just fill out our entry form to enter our drawing. Contest has ended. Thank you for participating in our drawing.